Durable plastic identifier for keys, luggage, backpacks, children's totes, etc. Paper insert for address. Assorted colors: black, blue, green, purple, red and yellow. Bulk 75 pieces per bucket. Formed, rust-resistant steel. Holds a number of keys securely. Formed, rust-resistant steel. Holds a number of keys securely. Used to code keys by color. Assorted multi-colored includes blue, purple, green, yellow and red. Medium fits most standard keys. Bulk. Lockable design with beaded chain. Size: 2" For narrow belt loops, slender shoulder straps, and ring fasteners. This key chain separates at barrel to leave ignition key in vehicle while using house or other key; package includes (1) pull apart, quick release key chain. For narrow belt loops, slender shoulder straps, and ring fasteners. Fastens securely to belt keeping keys safe and handy. Aluminum body. Bottle opener with key chain. Anodized finish. Assorted animal-shaped openers including lizard, alligator and shark, Do Not Specify. Aluminum body. 2-1/2" whistle with key chain. Made of lightweight plastic and available in a variety of colors. Its double-gated design has the same functionality and same nearly endless variety of uses. Ultra-handy dual spring gates will hold, secure and connect everything from house keys and cell phone holsters to technical camping gear. Attach valuables to the center bar for ultimate security, link gate ends to a second set of items and anchor or connect many items together. Assorted neon identifiers include green, orange, pink, and yellow; assorted multi-colored include blue, dark green, light yellow, and red. Used to code keys by color. Assorted neon identifiers include green, orange, pink, and yellow; assorted multi-colored include blue, dark green, light yellow, and red. Small for luggage, locker, padlock, and security case keys; medium for most standard keys, and large for large-headed keys. 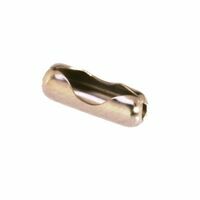 Standard size numbers: #10 is 3/16" bead diameter. Use for making key chains. 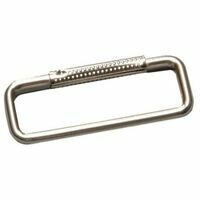 Attaches to a belt loop or strap, or wear around wrist. Pull-apart rings allow you to organize keys for home, work, and car, and to easily leave specific keys with friends, co-workers, or mechanics. Lays around neck comfortably for whistles or keys. Length: 1 inch. Lays around neck comfortably for whistles or keys. Length: 1 inch.